The Coffee Club has overhauled its menu with help from celebrity chef, Justine Schofield. The refreshed menu includes both new dishes and updated versions of older menu items. New meals now available include saluted caramel banana pancakes, turkey and cranberry cheese toastie and chicken, pumpkin and pesto flat grill on a soft tortilla. Chorizo, tomato and basil have been added to The Coffee Club’s omelette menu. 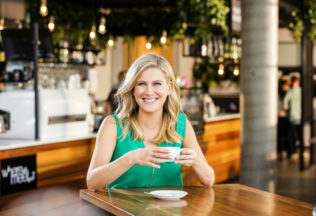 Australian chef, Justine Schofields, said she tried and tested the new menu items in her own kitchen prior to adding them to The Coffee Club menu. “My new offerings are based around the philosophy of honouring the Aussie favourites like the classic omelette and BLT, but I’ve given each dish a new life by pairing the staple ingredients with bold flavours and loads of fresh herbs,” she said. Founding Director of The Coffee Club, John Lazarou, said that research shows Australians value meals with a home cooked feel and The Coffee Club is increasingly opting for familiar dishes with modern twists. “We know that our customers are obsessed with family favourites as they symbolise relaxation and catching up with loved ones, so we’ve embraced that – working with Justine on dishes that taste great and can be enjoyed at any time of day,” Lazarou said. The Health Lab has launched a range of ready-to-drink protein smoothies. The winners of the 2017 Australian Grand Dairy Awards have been announced.